Have you ever received a greeting card created in PowerPoint? Maybe I receive more of these than most people, but I get them several times a year. 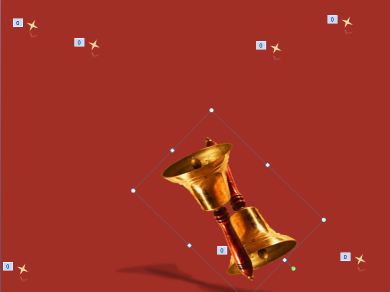 A nice effect, especially for holiday and New Years’ greetings, is a swinging bell or pendulum. You use the Spin animation, but it has a problem for this type of effect; it spins around the center of the object you’re animating. It is, after all, a spin effect, not a swinging effect. Insert the object or image that you want to use. 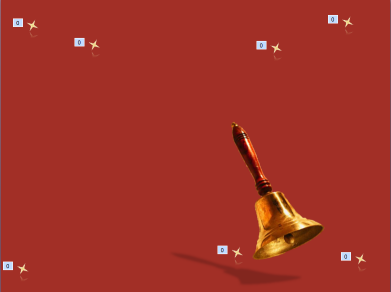 I found an image of a bell and removed the background. (I used PowerPoint 2010’s background remover to do this. Cool!) Don’t worry about the image’s angle; you can change it later. Select the object and press Ctrl+D to duplicate it. Move the copy so that it is exactly opposite the original. Select both images and group them. In 2007, press Ctrl+G. In 2003, go to the Drawing toolbar>Draw> Group. As you can see, you have now changed the center of the image. 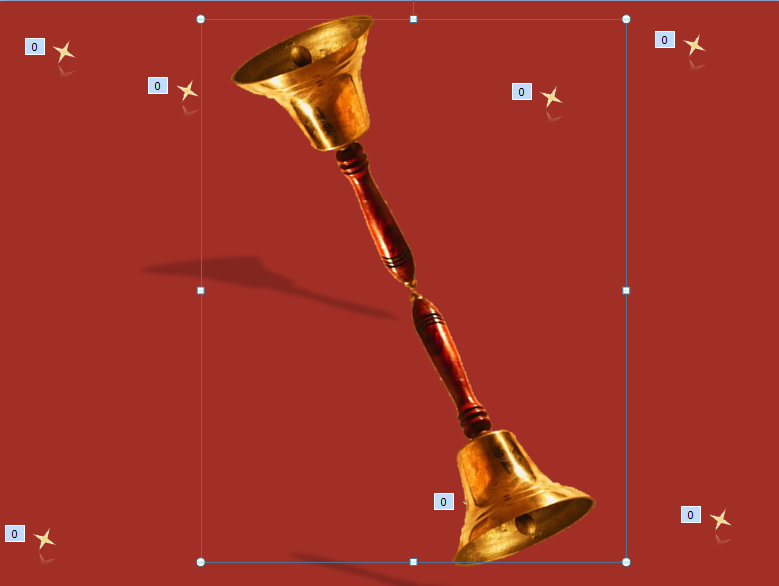 In my example, the center of the image is now the top of the lower bell, just where I want it. Move it off the slide. That’s what I did. If you’re using PowerPoint shapes, you can make the upside-down image invisible by removing the outline and fill, or making the fill 100% transparent. Even after grouping, you can click the upside-down image to select it within the group and format it separately. If you’re using an image, you can draw a Freeform shape over the copy and use that instead of the image. The only purpose of the copy is to move the center of the Spin animation effect to where you want it to be, so a Freeform that closely matches the outline of the image works fine. Here you see an example. Then, make the Freeform invisible. The Preview feature spins your object 360°. You probably don’t want that! Click the Custom drop-down list in the task pane, and enter an amount in the Custom text box. You can also choose to spin clockwise or counterclockwise. In the Speed drop-down list, choose a speed. For more control, choose the animation in the list of animations, click the Down arrow, and choose Timing. In the dialog box, enter a value in the Speed text box. For example, you can enter 1.45 (in seconds). Click OK. In my experience, the first time I go into Slide Show view, the sound and the animation are not perfectly synchronized, but if I repeat the animation (I right-click, choose Slide> Go to Slide> Slide 1, and then click the slide), the repeat is much better. PowerPoint seems to drag the animation after the sound on the first run-through. 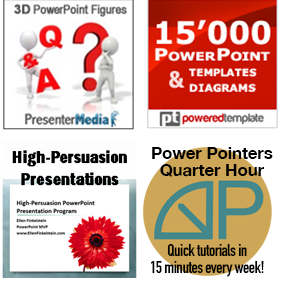 You can download the PowerPoint file in 2007 (.pptx) format here and in 2003 (.ppt) format here. It’s my New Year’s card to you! I find it easier to set a center of rotation by drawing a circle larger than the object and moving it so its center is at the desired center of rotation. Make it invisible and group it with the object. Done.